*Standard retail prices as of 2/4/2019. Prices and availability are subject to change and can vary by retailer. Doorbell cameras don’t just help you keep an eye on your home’s most vulnerable point of entry. They also help you track deliveries, watch what’s happening on your front porch, and see any visitors that stop by while you’re not home. But with so many different video doorbell options, we want to make sure you’re choosing the best doorbell camera for your home. Data effective 1/24/2019. Offers and availability subject to change. IFTTT is a platform that can help you circumvent compatibility issues with different smart devices. The Nest Hello offers advanced features like facial recognition and motion/sound detection. 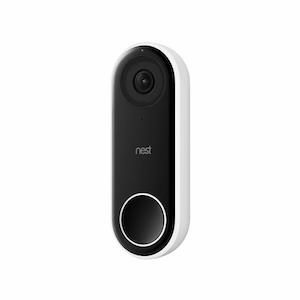 The Nest Hello is an aesthetic doorbell built with a strong camera and solid night vision performance. 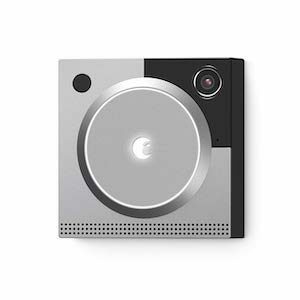 But its extra abilities like facial recognition make the Nest Hello our favorite doorbell camera. While most doorbell cameras tell you when someone is at your door, the Nest Hello can tell you who is at your door. That’s really cool. You’ll want to get a Nest Aware plan if you opt for the Nest Hello. Plans start at $5 per month and give you five-day video history, continuous recording, intelligent alerts, timelapses, and the ability to set activity zones. Dimensions: 1.7 x 4.6 x 1 in. Don't want to deal with hardwiring a doorbell camera? 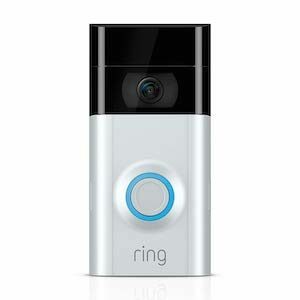 The Ring Video Doorbell 2 is a great wireless option. The Ring 2 is a lot bulkier than the original Ring Video Doorbell, but it records crisp 1080p video, which isn’t bad for a wireless doorbell camera. If you’re renting a house, or you simply don’t want to deal with hiring an electrician to wire your doorbell camera, the Ring 2 is going to be your best option. It can be hardwired, but if you went that route, you might as well opt for the slimmer Ring Pro. With all Ring cameras you’ll want to pay for a Ring Protect plan. The Basic Protect Plan starts at $3 per month and offers motion alerts, custom motion detection settings, live video, and 60 days of video storage. Dimensions: 5.1 x 2.4 x 2.4 in. Not only is SkyBell rich with features but you also don’t have to pay a monthly fee to get access to all the perks. Color night vision and cloud storage come standard. That will save you a good amount of money over time, considering Nest’s plans start at around $5 per month. 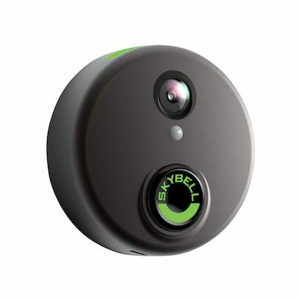 Beyond its features, the SkyBell HD camera is sharper and more reliable than the spottier Ring cameras. Dimensions: 2.8 x 2.8 x 0.9 in. The August Doorbell Cam Pro makes it easy to save and capture video footage. 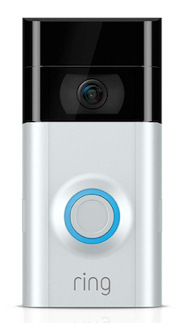 The August Doorbell Cam Pro uses the same resolution as a GoPro (960p HD) which gives you a higher frame rate for improved motion capture. That means you can slow down footage while maintaining clearer video. We really like August’s HindSight feature, which retroactively records a few seconds of footage before a motion detection event, giving you extra context when you need to review a video. If you’ve been looking into smart locks for your home, you could always pair this doorbell with the August smart lock – one of our favorite smart locks on the market. Dimensions: 2.9 x 2.9 x 0.9 in. The Ring Pro is slim with a clean design, giving you sharp 1080p video and Alexa voice command. Ring Pro shares a lot in common with the Ring 2 except that it’s slimmer and requires hardwiring. It’s a better option if you’re tight on space or if you don’t want to deal with Ring 2’s rechargeable battery. We also think the Ring Pro performs a little better in terms of video quality, even though their tech specs are similar. Dimensions: 4.5 x 1.85 x 0.8 in. If you have a SimpliSafe home security system, it’s worth looking into the new SimpliSafe doorbell camera. It offers a 1080p resolution and 160º field of view. It alsot gives you features like two-way audio, motion alerts, and pan and zoom. Even if you don’t have SimpliSafe, you can still use the doorbell camera on its own with the SimpliSafe app. If you don’t need a camera, or if you already have Arlo cameras, the Arlo Audio Doorbell is a cheaper alternative to the video doorbells above. Arlo’s wireless doorbell gives you features like visitor messaging, remote communication, and seven days of free cloud storage for audio recordings. Amazon hasn’t yet released its Blink Video Doorbell, but it’s something to keep your eye on if you’re looking for a doorbell camera. The camera is going to be wireless with live video streaming, two-way audio, night vision, and motion detection. And it might cost considerably less than the wireless Ring 2. When it comes down to choosing a video doorbell, we really like the Nest Hello. If you’re willing to get the electrical work done, and if you’re okay that the Nest Hello is supported only by Google Home (and not Alexa), then it’s simply the best video doorbell on the market right now. 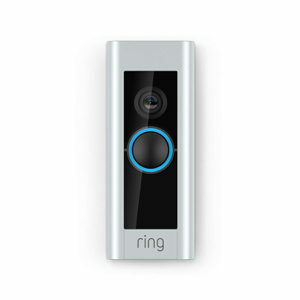 If you’re renting a place and don’t want to deal with complicated wiring, or you’d rather just opt for a wireless doorbell camera, the Ring 2 is your best bet. If you want a doorbell camera that’s supported by Alexa, we recommend the SkyBell HD. The Ring cameras offer Alexa support, but neither quite lives up to the camera quality or wealth of features that come with the SkyBell camera.